Today, we are excited to introduce Penny, the classic shirtdress. The shirtdress is an iconic style that has been reimagined by designers, decade after decade. And it is easy to see why—with its tailored details and flattering fit, the shirtdress is charming and wearable. Whether you choose to sew a shirtdress in a crisp cotton shirting for a classic daytime look, or an elegant viscose floral for an alluring, tailored piece, you are sure to have an enduring dress that you’ll love to wear for years to come. The Penny dress offers all of the classic design details you love about the shirtdress. This charming shirtdress features a fitted bodice, with traditional shirt details like a collar stand, button placket, and shoulder yoke. These thoughtful details allow you to learn new sewing skills or perfect existing ones. Feminine details, like the two skirt variations and the overlapping, gathered waist belt, will help you sew a one-of-a-kind dress. Version 2 has a sleeveless bodice, a semi-circle skirt, and an overlapping gathered waist belt. The skirts can be mixed to match either bodice so that you can create a customized dress for your style. We used a gorgeous cotton lawn from The Fabric Godmother for this version. The Penny dress is ideal for lightweight and medium weight woven fabrics. Our new patterns now include two different size ranges. This means that you can choose our misses size range (0-16) or our curvy size range (18-26). Sizes 0-16 are drafted for a C cup and sizes 18-26 are drafted for a DD cup. By using two body types, we can create an enhanced fit for all sizes. You can read even more about these changes here. If you purchase a printed pattern from our shop, you will also receive a digital pattern that includes all sizes. This allows you to print any sizes that you do not have in your printed copy. Digital patterns include both size ranges. Please pay extra attention in the shop to make sure you are ordering the correct size range. The product page has a drop-down menu so you can select the different size ranges all in one place. Penny also features our new packaging, including full-color instruction booklets packed with helpful sewing tips, inspiring pictures, and our new fit guides. All of our patterns will get updated packaging as they are reprinted. Penny is 15% off until August 1st. We can’t wait to see your inspired makes! You may have already noticed that this is the second Penny shirtdress on the block. Last month, Lisa over at Sew Over It released a beautiful shirtdress pattern, also named Penny. Just one more example of all of the lovely shirtdress variations out there! You can check out her take on the shirtdress in her shop. I am so excited to sew this up! I do have several Seamwork credits — will Penny be available to purchase using those after the 15% off promotion? I’ve been purchasing your patterns for a while (the second garment I ever made was Zinnia, v. 2!) and I’ve grown so much as a sewist, thanks to your patterns and tutorials. I’ve so enjoyed watching your packaging and style change over the years! Hi Milly! Thank you for the kind words. The Penny dress will be available in the Seamwork shop after our fall pattern release. I have this – lovely pattern – is there a map of A4 tiles/pieces? I’m doing the top in version 1 and the skirt from version 2 – I dont want to print off everything if I can help it. Hi, Claire. The pattern assembly was missing initially, but it’s added now. If it’s not appearing in your instructions, just download them one more time and you will find it on page 17! While I like the idea of having two different pattern blocks and ranges, I wonder whether this will cause difficulty for people whose size and shape falls across the two ranges. Will you be providing any tips for how to blend sizes from two ranges? 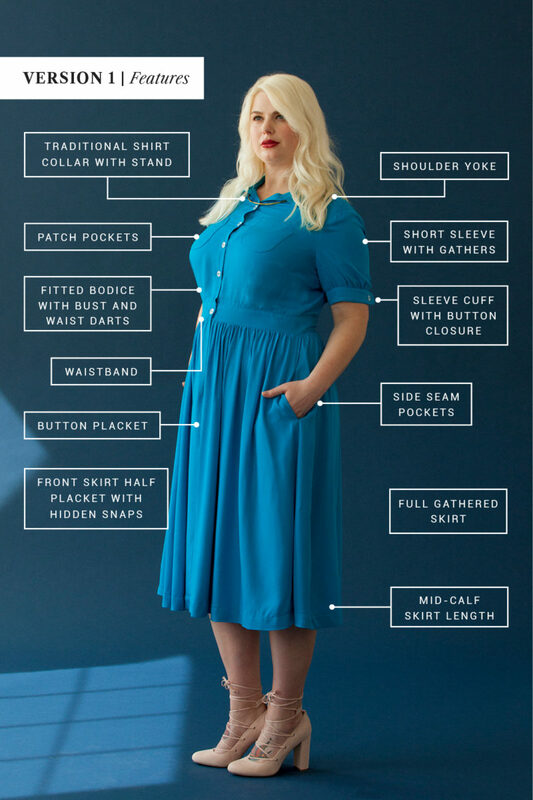 Your “curvy” model is lovely and I like that shade of blue, but the sample dress is not well sewn and you should not be using the same size pockets for the “miss” and “curvy” blocks. Such a small pocket does the larger bust no favours. Hi Pelly, we offer some support on blending sizes here. And we are always happy to provide specific fit guidance via email. We appreciate your feedback! I really like the overall idea of this pattern, but I’m a bit concerned about the fit. I have quite a large bust and a large difference between bust and waist. The blue version looks like its pulling A LOT around the bust and sleeve at the front, on your model, which makes me a bit wary – I’d want to be able to lift my arms above my head. I know that you’ve had some problems with fit around this area in the past that you’ve said you’ve worked on in your new pattern blocks, so could you give us a bit more of an idea of how you feel the pattern should fit in this area? Hi Alexandra, with any fitted dress with sleeves you might experience some pulling when you lift your arms. With our new block, you will definitely see improved fit in the bodice and sleeve. As always, we recommend making a muslin and any fit adjustments necessary for your body. In the pattern, we provide finished garment measurements and fit guides to help you get the right fit. It sounds like you might benefit from blending between sizes or a full bust adjustment. We appreciate your feedback! Threads has some good tutorials on adding underarm gussets to address this. They’re in the paid archive, however. I would love to see a modern pattern drafted with an underarm gusset. Thanks Lizzy! I’ll have a search for information on underarm gussets. I’ve never done one before, so even if it doesn’t help my fitting issues, it’ll be a useful exercise! Gussets are the devil!!!!! hahaha. But in all seriousness, in one of Gertie’s books (sorry if this can’t be posted here) she has a dress with underarm gussets. Her patterns come with all sorts of fit issues as well, but that aside, gussets are a big pain to sew and probably the main reason they aren’t featured more promenantly in modern sewing. But if you’d like to try your hand at it I recommend searching some tutorials and do some practice peices. You may find after that you will never want to sew another one for as long as you shall live… or you may find you like the challenge. I certainly love the look of them, that’s for sure, but the pain of sewing them out weighs my love of their look. Haley, while I appreciate you taking the time to respond to me and my comment, I don’t really feel as though you answered my question. The fact is, you have had a lot of feedback in the past year about your block and how it is ill-fitting in the bodice and sleeves. This is your new pattern, and it seems to me that, looking at the samples shown here (in particular the curvy version with sleeves) your block still has fitting issues. That blue version looks very uncomfortable on the model, and it looks as though her movement would be restricted due to all the pulling in that sleeve. I was hoping that you would give us a little more in-depth information about the changes you have made to the block, and what you have done to eliminate some of the fitting issues. By doing so, you would give people (well, certainly me at least!) a bit more persuasion to buy the pattern! Hi Alexandra, we completely redrafted our block (both misses and curvy), rather than making updates to the existing block. We focused heavily on the fit through the armscye, sleeve, and upper bodice. All of this was done in an effort to address customer feedback regarding fit. We are always happy to answer questions specific to your measurements and our fit via email. Her question was not about a specific measurement. I believe she wanted a more general answer. I’m also interested in the answer. Haley, Like Alexandra I appreciate your answering the comments. But I have to take issue with your explanation that the bad sleeve fit on the blue version of the dress is due to the model lifting her arms. Um, she’s not lifting her arms. Her hand is in the pocket. The sleeve doesn’t fit because it’s too tight and the armsyce seam is too far out from the model’s actual shoulder joint. I’m also noticing the button placket is rippling, and the too-tiny breast pockets are wrongly placed and sewn on lopsided. I don’t really want to be piling on here, but I’ve got to ask … Who is approving these samples, the fit, and the resulting photos? Do you all not see these issues in pre-production that we all see? 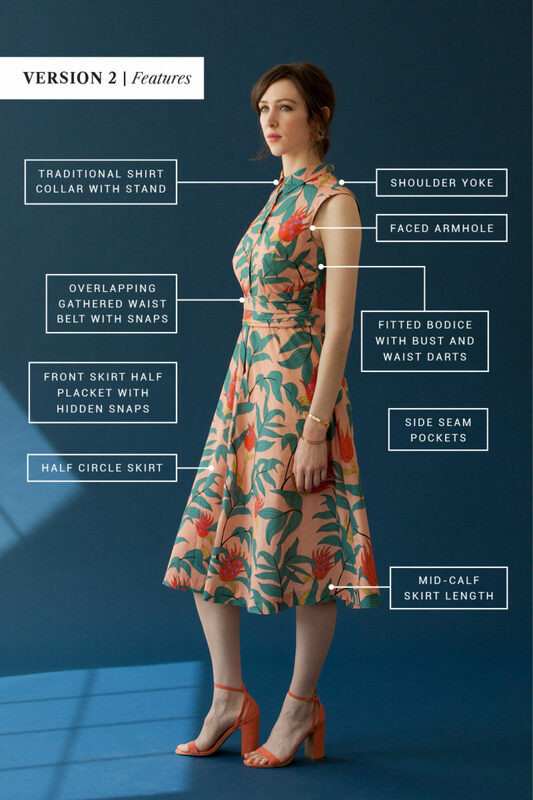 Is this really how Colette wants to present their patterns to the world? Hello. I just finished taping together and cutting out the peices for the Penny Version 2. And I can’t wait to sew it up, just a question, will there be a sew along for this dress? As I am bit confused, one side of the front skirt peices is wider than the other. Is this because of the placket? Thank you for any advice you can give and I can’t wait to get this sewn!!! Hi Heather, I can’t wait to see your Penny dress! I love version 2! The skirt pattern pieces are asymmetrical because of the snap placket. At this time we do not have plans to host a sewalong but we are always happy to answer your questions via email. I am very excited to try out this pattern. your blog says that the skirts are interchangeable, is this also true of the waistband? I would like to use the sleeved version of the bodice with the gathered overlapping belt. Does the armsyce of the version 2 bodice also fit the sleeves? Thanks! Great question! No, the armscye is drafted differently for each version. The bodice for version 2 is also longer than the bodice for version 1, since it does not have the flat waistband. If you want to add the gathered waistband to version 1’s bodice, be sure to lengthen the pieces to be the same length as version 2 (it should be about 1 1/4″ longer). Then you can follow the instructions to add the gathered waistband. Hope this helps! One of my favorite things about Seamwork is the guidance on fabric. It talks about how possible fabric choices effect the finish, and has lots of specific recommendations. Something like that for Penny would make a fascinating blog post. :) (I also really loved your substrate series with Cotton & Steel!! ).